The Pega 7 Platform provides business users with the means to implement and test modifications to their applications outside the enterprise release cycles. Revision management enables business users to respond quickly to changes in the external and internal factors that influence their business. Responses might include introducing new offers, imposing eligibility criteria, or modifying existing business strategies. To change business rules that govern decisioning strategies and proposition management, business users use the Decision Manager portal in the Pega 7 Platform. 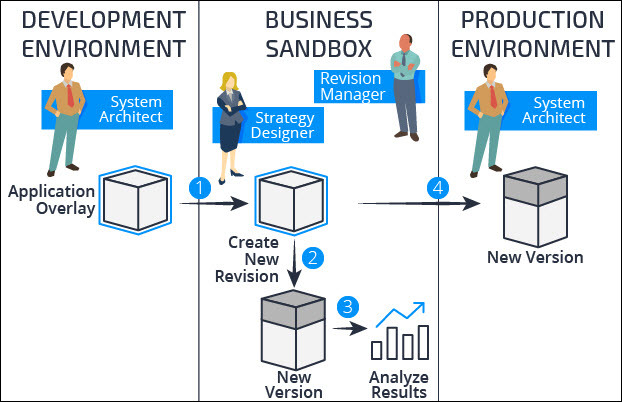 The Decision Manager portal is for users who can manage revisions of decisioning rules in business sandbox environments and monitor the effectiveness of decisions that are made in production environments. Revision management involves two roles: revision manager and strategy designer. A revision manager initiates a change to business rules by creating a new revision. Each revision consists of one or more units of work that are called change requests. A strategy designer implements changes by amending the business rules that are part of a change request and reassigns the change request to the revision manager. The revision manager approves the change request and prepares a revision package for the system architect, who deploys the package in the production environment. For more information, see the Decision Manager Portal Overview course. Changes to the rules are implemented through a change request or change requests that are part of a revision. Revision management of business rules is a multistep process that takes place in different environments and requires the Decision Manager portal. The process to create a revision and export it as a revision package is based on the dynamic case management capabilities of the Pega 7 Platform. The revision management cycle is complete when the system architect creates an application overlay with a set of rule instances to be placed under revision. Then, the revision manager uses the rules instances in the application overlay to create a revision with change requests and assigns the change requests to the strategy designer. After the strategy designer makes changes per the change requests, the change requests are sent to the revision manager for approval. Finally, the revision manager prepares a revision package with the changes and asks the system architect to deploy it and activate the revision. For more information about revision management, see the Manage Business Rules Changes course.